These thin grasses frayed while quilting but I just went over them with a lot of thread. Again I learned that this might be better with a darker thread. Next time doing that. Being to lazy to change my thread for the fence posts, I see I will need to color over it with a dark marker. And that's ok, it will work. 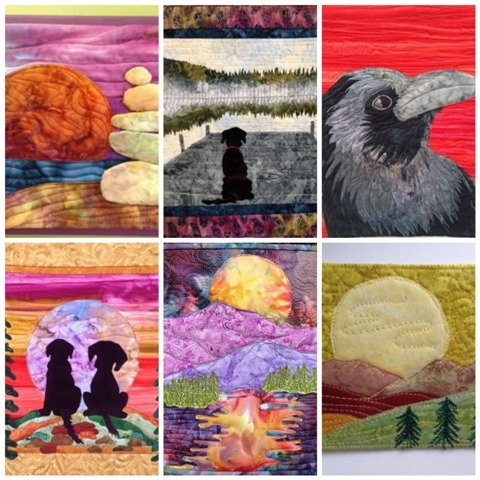 Join us - sort of like a virtual quilting bee. I used to make a lot of these about 20 years ago. They take a lot of hand sewing but I like to sit with my feet up on the couch and sew - very relaxing. It's not finished yet but you can get the drift. They are nice and puffy, being stuffed on all sides and top with fiberfill. The sides are sewn by machine, turned and then stuffed first inserting cardboard then fiberfill. Then you slip stitch each edge closed. I may try another and figure out a way to make a tab thing for a closure. 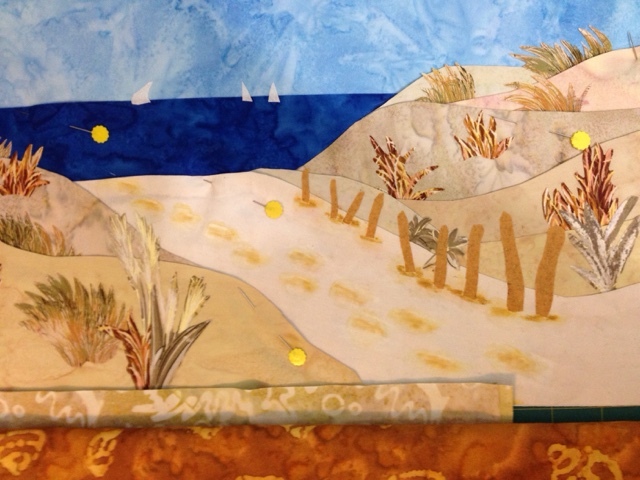 I finally finished quilting my beach scene and have started on another. Am making a pattern for it so will do at least 3 with some variations. Wish I was on the dunes right now. Christmas next week already - have a Happy Christmas! 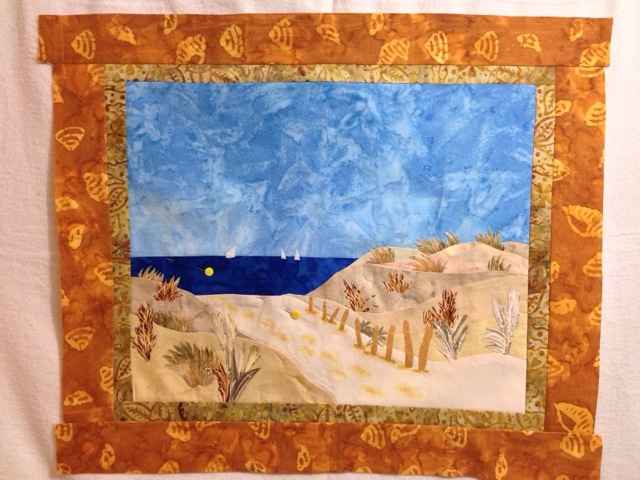 A fidget quilt is a small lap quilt for a person diagnosed with dementia or alzhemers. The idea is to attach things on the quilt that can keep the hands busy doing a simple repetitive thing. It's also a good conversation piece for people to be able to talk and ask questions of the patient as well. I had made this falling charms quilt and have a co worker whose mother has been diagnosed and she has been going thru putting her in a facility and caring for her which is extremely hard. This is for her to give to her mom. The quilt itself has an all over meander so after washing it is all nice and crinkly. That alone has a nice texture. The back is a nice bright cheerful print. There is a metal ring attached to one corner so it could be hung up or something Sarah may want to attach that means something special to her mom. The big zipper opens nothing but is fun to open and close. On the bottom edge and a heart on the front is a soft buttery, velvety feeling suede. I love how this came out. This year I am not spending a lot of time making gifts for people at work like I usually do. Most of them do not appreciate the time spent on a handmade gift anyway so I am choosing to instead spend the time on one gift that I know will be loved, used and appreciated. And yes it has taken me 20 years to come to this place with no pre Christmas deadlines and stress. Do you get that feeling that you need to make things for everyone around Christmas time? 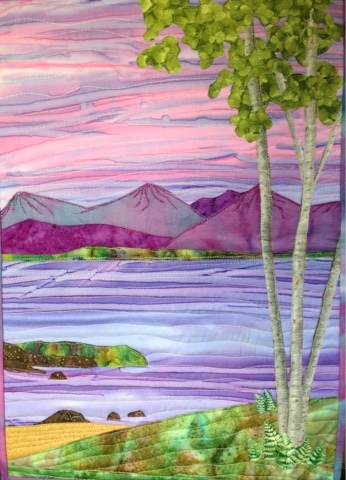 The sky and water is one piece of purchased fabric and really makes this landscape. A case where I let the fabric do all the work. I found these huge acorn caps the other day- mostly the double ones. The Squirrels took all the bottoms but I can make those! I made these little fabric acorns. How cute are they! I made a circle of fabric about 2 1/2 inches in diameter, did a running stitch by hand, gathered it up and stuffed with fiberfill. then tacked it down closed tight. You could now glue that into the cap now and be done with it but oh no! I had to do more. I wanted to be able to hang it or stick it somewhere. So to go that route you need to resist the temptation to glue the fabric to the acorn first. I know it's hard, you want to see the fabric acorn cuteness but hold on! You will need a little magnet. and a thin piece of ribbon or twine. Make a simple bag to fit the magnet but first fold the ribbon in half and lay it between the two fabric pieces for the bag- you know how to do the bag - by sewing 3 sides, right sides together. turn inside out and fold the unsewn edge inside. The ribbon should be laying with the fold just peeking out of the opposite side of the unsewn edge. The tails of the ribbon would hang out thru that edge you will now be sewing. You really need to sew this closed by hand after turning if you don't want to see the stitching. I tried the machine but it didn't look right. Now you need to drill 2 small holes in the acorn caps - a dremel tool will do this nicely. If you don't have a dremel tool ....... well why don't you? Now thread the ribbon ends thru the acorn cap holes using a yarn needle since it has a huge eye and can take the ribbon and tie to secure. If you don't have a yarn needle ........... well, why don't you? NOW you can glue those fabric balls into the cap, sew a button on the top of the magnet bag and look at all of that acorn cuteness. I like to wrap the ribbon around the button so they don't flap around and will use as a pincushion but need to make sure it is well away from my little dog. that's why the magnet as I can keep it high in a secure location.